This Vienna is a movie milieu as densely evocative and as emotionally harrowing as Curtiz’s Casablanca or Sternberg’s Morocco. Yet, unlike those two studio classics, it is primarily the real Vienna that the filmmakers show us here: the real streets, the real war-torn buildings, the real rubble — shot by Reed and cinematographer Robert Krasker in such a striking style (with almost constant off-angle compositions, deep, deep focus and wide-angle lens distortions), that it all takes on a patina of nightmare. Through this macabre landscape—over which Anton Karas’ legendary zither score jangles with ironic jauntiness—Greene and Reed’s dark tale unwinds with a suave, sinister perfection. We watch, probably spellbound (I was, at any rate), as a naïve and foolishly romantic American hack novelist, Holly Martins (a specialist in formula genre westerns, who cites his major literary influence, without irony, as Zane Grey), pursues the murderers of his lifelong best friend, Harry Lime. Holly, maddeningly and lovably inept at almost everything a movie hero should do or be, spars testily with the embittered, cynical British police major, Calloway; hunts for the mysterious “third man” who may have witnessed Harry’s death; and falls hopelessly and unrequitedly in love with Harry’s mistress, the beautiful, beleaguered Anna Sdhmidt, trapped by Calloway and the police bureaucracy. Finally, in two symbolic settings—the Ferris wheel towering above the city, and the shadowy chaos of the sewers beneath it—Holly comes face to face with the supreme evil and the supreme betrayal: both Harry’s and his own. The Third Man is one of those rare film classics that captured its audience almost immediately and was regarded as a masrwepiwxw almost from its first release. The movie marks one of those unusual conjunctions of script, director, subject, cast and setting—and, of course, music—in which everything meshes, everything works. Graham Greene’s script, which he first wrote as an unpublished short novel, is one of the all-time masterworks of original screenwriting — a brilliant psychological thriller and an unforgettable evocation of the post-war European battleground of urban international good and evil, with just the right proportions of drama, atmosphere, action, tension and rich character, all faultlessly constructed by the hand of a master. Or several masters. This was the second of three film collaborations between Greene and Reed — Greene’s favorite movie director, and an artist he greatly preferred to his own personal bête noir, Alfred Hitchcock — and it’s the crowning ultimate work for both men. Their other two joint efforts, both good but both flawed to some degree, are 1948’s The Fallen Idol (from a short story) and 1959’s Our Man in Havana (from a novel). But there’s nothing much wrong with The Third Man, even if the world it describes is wrong to the core and bad to the bone. It is arguably the finest single work of any kind or genre Greene made, and the best of the more than 70 films in which he was involved in some capacity. Until somebody makes a more faithful film or TV adaptation of Greene’s great novel “A Gun for Sale” (a.k.a. 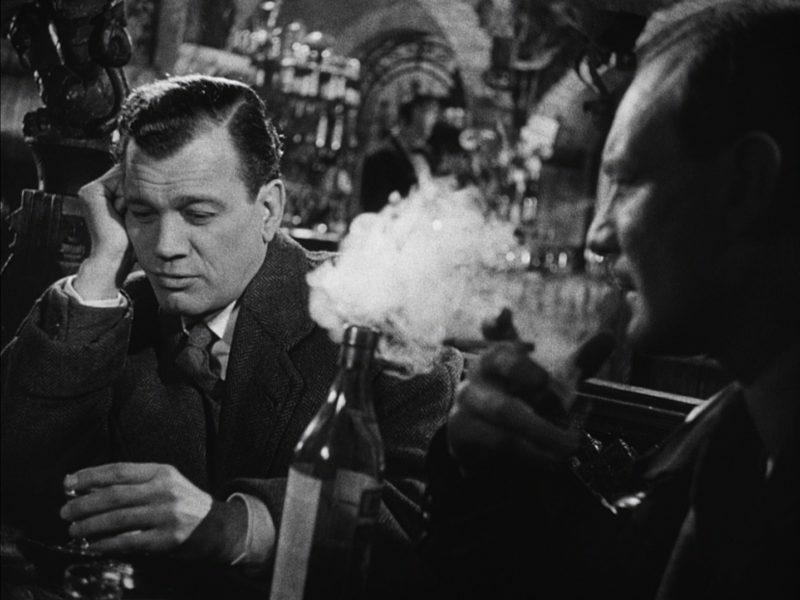 “This Gun for Hire”), which has been botched or bungled or miscast several times, but is a film noir masterpiece waiting to happen, The Third Man will probably hold its position, as a sort of Citizen Kane of film noir. And Greene will retain his own place as (how he would have hated the title!) the Alfred Hitchcock of Beitish screenwriters and script sources. 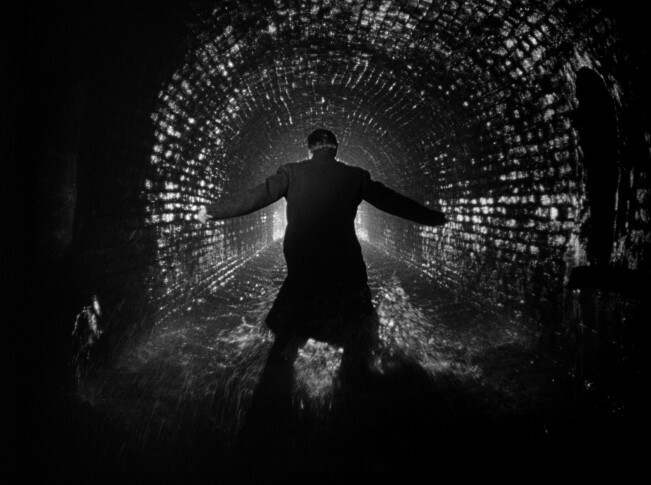 The script is a matchless wonderful job, and all the other components of The Third Man more than worthy of it. Krasker’s and Reed’s visuals are the absolute peak of black-and-white film noir style; one watches them rapt, mo matter how many times you’ve seen the film. The acting ensemble is superb, with the mix of Americans and Europeans in the cast creating an ideal balance: Trevor Howard as the pragmatic, saddened, yet brutally unsparing Calloway; Bernard Lee (James Bond’s M himself) as the gentle Sergeant Paine, who loves Holly’s books; Wilfred Hyde-White as Crabbin, the slightly addled literary entrepreneur; Ernst Deutsch as the sinister, ferrety “Baron” Kurtz; Alida Valli, exuding fatalistic romance as Anna; and those two refugees and best friends from Citizen Kane, Orson Welles and Joseph Cotten, as the two old friends torn asunder, the dark side and the light, Harry and Holly—their names so similar Anna often confuses them. 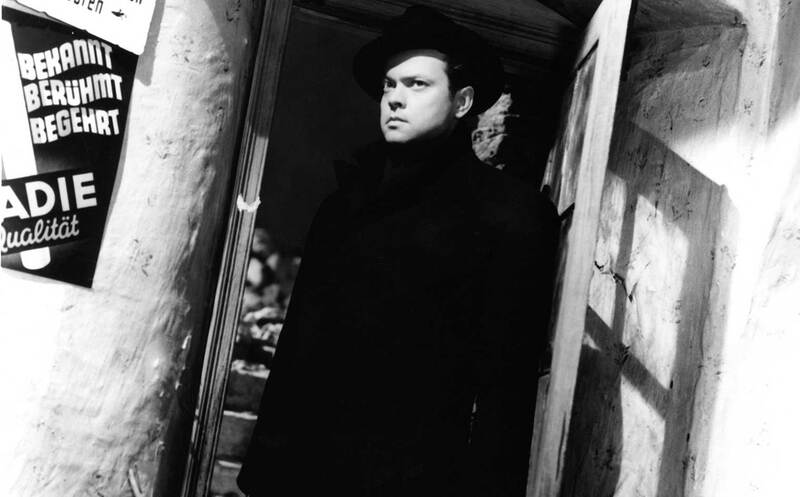 Welles’ relatively brief performance as Harry Lime is perfection itself: the bemused, lightly condescending, affectionate look with which he greets Holly; the murderous fluency of his Machiavellian story of the Borgias and the cuckoo clock (a disparaging comparative analysis of the artistic benefits of tyranny and democracy, that Welles himself wrote); or his wild desperation as he flounders in the sewer, with Holly, Calloway and the police after him. This is magnificent, highly charged film acting, by a nonpareil actor, perfectly cast. Because the two great set pieces in The Third Man—the Ferris wheel confrontation and the chase through the sewers—both are designed around Welles, and because they’re both shot with the kind of weirdly angled grandiloquence and impudent virtuosity for which he’s always been noted, there’s a temptation to believe that Welles directed them, and maybe the rest of the film as well. Most of this article was originally written for The Criterion Collection’s box notes on their original video release of The Third Man.